Wouldn’t you know that there would be a trio of new podcast episodes worth mentioning within days of my latest post? Item One – Ken and Robin, as they are wont to do, talked about stuff, including collaborations, cartel-employed juju men, and killing Ogedei Khan. Item Two – The Cthulhu Breakfast Club dined on toast and eggs with mushrooms. They also discussed (among other things) Chaosium’s Nameless Horrors (the book, not Orient Express shipping woes), CthulhuWars, NecronomiCon 2015, Kickstarter (with protips from PoC and Chris Lackey), and some upcoming UK cons. As one wag put it, it was a breakfast of champignons. Item three – Oscar Rios, of Golden Goblin Press, was interviewed by the Tabletop Torch about their current and possible future projects, including more information on their next book Tales of the Caribbean, all sprinkled with practical advice from Oscar about RPG creation and running a small press. Chaosium has released the scenario collection Nameless Horrors on PDF. As they put it: “Nameless Horrors brings you six new scenarios that will frighten even the most experienced of Call of Cthulhu players, giving them reason to fear the unknown.” The sextext of scenarios were written by Paul Fricker, Scott Dorward, and Matthew Sanderson (aka the Good Friends of Jackson Elias) and I look forward to a print version… Speaking of which, Chaosium has also put out a print version of Cthulhu Through the Ages, their setting sampler book for 7th Edition. The Audient Void, which collects the various times I’ve been interviewed on podcasts. I have also updated the Lovecraftian RPG 2015 list. I posted an update to the Kickstarter page for the Arkham Gazette #3 discussing where the project stands, an estimated time of delivery, etc. Backers also were sent a preview of most of the issue’s contents, save the scenario Queen of Night. The Good Friends of Jackson Elias – Ep. 51, Talk on a pair of horror films – Repulsion and The Babadook. They also are conducting a poll of their listeners. Ken and Robin talked about Vehmic Courts, the research secrets, and CthulhuCon. Miskatonic University Podcast – Talked about organized crime, among other things. The Witch’s Tree a.k.a. The Kimball Elm. 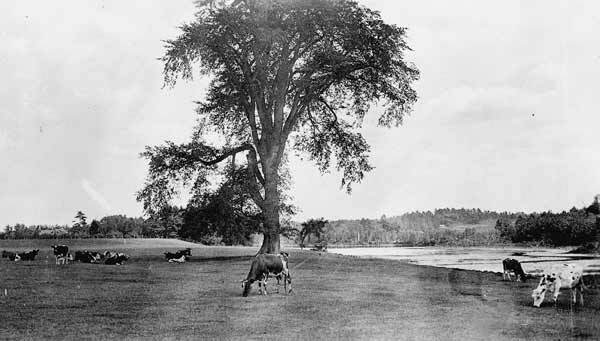 This tree is supposed to have stood on the Dudley farm. The tree is long gone, thanks to Dutch Elm disease. An incident occurred in 1720 which made quite a sensation in town at the time. It was no less than a witchcraft accusation which might have proved still more sensational had it not been for the death of the person accused. Joseph Blanchard, who lived on or near Mr. Elbridge Marshall’s place, had at that time three young daughters — Elizabeth, aged about eleven, Joanna, about nine and Mary, about five or six years. These children, first the eldest, then the next, and finally the youngest, began to act in a very strange and unaccountable way. Elizabeth began by telling very strange stories of things happening at the time, or supposed to, and forced into the water, and in danger of drowning, at which she would cry out in distress. She also complained of pinches and prickings of the flesh, and showed wounds, and rents in her clothes, asserting she was bewitched, and accused Mrs. Dudley, wife of Samuel Dudley, town clerk, of bewitching her. When put to the test of reading Scripture she would read, but fall down apparently lifeless when she came to the words “God,” “Christ,” or “Holy Ghost.” She would bite people, excepting Rev. Mr. Shattuck, whom she appeared to have no power to hurt. About four months after Elizabeth began to act in this way, Joanna also began to do the same things, and once was found on the top of the barn, a place apparently impossible for her to reach by her own exertions, and whither she said she was carried up through the air. About two months later Mary began the same actions. Elizabeth would often cry out, “There she is! there’s Mrs. Dudley!” when Mrs. Dudley was nowhere visible. Once she told her mother there was a little bird in a certain part of the room ; her mother having something in her hand, struck at the place, at which Elizabeth cried out, “Oh, mother, you have hit it on the side of the head.” It was afterwards found that Mrs. Dudley was at the same time hurt on one side of her face. Another time Elizabeth said to her mother, “There’s Mrs. Dudley; she is just there; coming to afflict me!” Her mother struck the place with something and Elizabeth cried out, “You have hit her on the bowels.” It was found that Mrs. Dudley, at the same time, felt a pain, took to her bed and died in a few weeks. On the face of this story it appears very mysterious and inexplicable by natural causes. Blanchard and his wife believed the children sincere and guileless, and though some wiser ones including, it is thought, Mr. Shattuck, advised separating the children by taking one or more to their homes, the parents would not consent to it, and the majority believed them bewitched. A few days after the death of Mrs. Dudley the strange actions of the two older children ceased. It proved however, that Mrs. Dudley’s death was perfectly accountable; she was in a delicate condition, and on riding horseback behind her husband at a rapid rate felt something break within her. Though the children for a long time persisted that their stories had been true, and Elizabeth did not weaken, even when, requesting baptism, she was questioned by Mr. Shattuck about the circumstances, and told that some of her neighbors suspected her of falsehood; yet eight years after the girls confessed to Rev. Mr. Turell, minister of Medford, to which place they had moved, that their stories were all false and that their strange actions, begun in a playful spirit of mischief, had been continued because they were ashamed to own up. When they heard of Mrs. Dudley’s death, who, by the way, was a most estimable woman and against whom the children had no cause for ill-feeling, the two oldest children were thoroughly frightened, and for a long time lived in fear of a ghostly retribution. Elizabeth told Mr. Turell that she got her idea of acting in the strange manner from reading about witchcraft, and the other children picked it up from her. As we can see, there are all sorts of interesting annecdotes to be found in 19th century town histories. This incident is not recorded in the usual register of witch accusations as the there never any formal charges made, and so the case was never a part of the legal record. Here is an interesting discussion of how a town history in the 1970s badly got this story wrong. Much of the old Yog Radio gang (from several iterations) have joined together for a new (hopefully!) podcast series: The Cthulhu Breakfast Club. Paul of Cthulhu is joined by Val and Finn (of the YSDC actual play group), Chris Lackey (of News from Pnakotus and the HP Lovecraft Literary Podcast), and Marty Jopson. They talk about topics including YSDC’s new Trail of Cthulhu scenario “The Long Con”, Alone Against the Flames, Terry Pratchett, and more. There’s also a Patreon account set up to fund their scones (and bandwidth) – Patreon backers and YSDC patrons get access to additional material. Clotted cream is not free, my friends. The Good Friends of Jackson Elias talked about Robert Aickman and especially his short story “The Hospice”. Ken and Robin continue to talk about stuff, this time covering what scared them as kids (for Ken it was the folktale “The King of Cats” ), Toronto’s (less than) mysterious tunnel, and the Irminsul, the Saxon’s magic coin-filled-log. The Miskatonic University Podcast (with Keepers Dan and Jon) talked about Sand Dwellers and 7th Ed. combat rules. In Memory of Mr. Nathan Burpe, Died Sept 30, 1756 in Ye 25th Year of his Age. Next to his gravestone are one for his wife Azubah and his infant son Elijah. That phrase – “his house left desolate” – has always stuck with me and I’ve though of it more this week. As previously noted, we lost our cat Aurora over the weekend. Yesterday she was joined by one of our other cats, Charcoal. He was a rescued stray, recovered as a kitten from a cat colony. Unlike his other siblings, he never acclimated to human company and spent much of his life hiding under or behind things (and I’m having trouble finding a good picture of him rather than his tail), but I’d like to imagine we offered him a somewhat more pleasant and safer home than he would have had otherwise. He had been ailing for a while, but his death so soon after Aurora’s unexpected passing (and compounded by other losses of late) has left our house feeling more than a bit desolate. Goodbye Charcoal.